We love it, love it, love it! It doesn’t matter if it’s green, red or yellow – our family loves it! It’s comfort food. Its a one bowl meal. It’s a one POT meal. It’s perfect on a cold day. It’s perfect on a hot day. It is plain perfect. It was the first recipe you called and asked me how to make when you where living on your own at university, Bryson. Once I made it to take to a Chili Cook-Off contest, just to be different. And guess what? It did not win! It is NOT chili! Here’s a historical tidbit for you both. Growing up in the 80’s in the prairies of Western Canada, my family did not make or eat curries. Ever. Polish, Ukrainian, Russian, Italian… those were the common ethnic groups that inspired most of our family meals. With plenty of “Trailer-Park-Chic” food thrown in for good measure. That would be the salty, deep-fried brown bits, processed cheesy, light on the veggie, casserole kind of food. Our spice cupboard was more of a shelf. Well, a corner on the shelf. Salt, pepper, garlic powder, onion powder and seasoned salt. That was it. In the late 70’s (1979) a girl moved into an apartment complex next to ours. She ended up in the same 3rd grade class as me. NEW FRIEND!!!!!! Shazia’s family had just immigrated to Canada from India. For a little over a year (until my family moved) we did everything together. Her house always smelled so unique and exotic with all the spices her mom would use in her cooking. I remember the first time I was invited to eat dinner. It was my first introduction to yellow curry topped with a scoop of sour plain yogurt. With the first few bites my whole body went into shock. It couldn’t decide if it wanted to stand up and dance, or rebel and lose its fragile hold on the dinner I was eating. I didn’t know food could be like this bright yellow curry. It was HOT. I mean SPICY HOT, burn all the way down and back out kind of hot. The plain yogurt was cool and thick but so sour. It was so different. Every bite hit my nose first, and my nose was not sure it wanted to be there. It. Did. Not. Taste. Like. ANYTHING. I’d. Ever. Tasted. Before. My mom had one hard and fast rule. If you are invited to someone’s home for dinner… YOU EAT EVERYTHING that is put before you. So even though I could not decide if I liked that first curry or not, I kept eating. Funny thing, the more I ate … the more I ate. By the time I was finished, well, I knew that I would never forget that meal! That first yellow curry, while somewhat of a traumatic experience, opened up a whole new world of flavors for me. So I guess the moral of this story is: don’t just try something new with “one bite.” If you are on the fence or not sure how you feel about a new food, keep trying it. You might just end up loving it. Or you might just lose your fragile hold your dinner! Either way it will be an adventure! 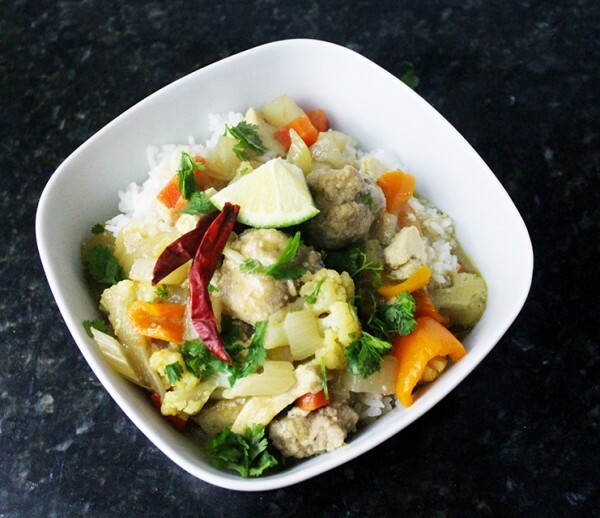 Traditionally green curry is served with fish balls. It is also generally a “broth-y” curry. 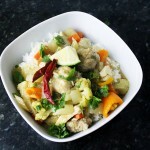 I like to make it with big chunks of brightly-coloured vegetables and pork balls instead of fish balls. A chunky spicy green curry with a coconut broth. Bright mixed vegetable and pork meatballs make it light and hearty at the same time. Served over rice and you have the perfect meal in a bowl! 4 TBSP palm sugar grated. Light brown sugar can be used as a substitute. 4 cups mixed fresh veggies Anything you like! 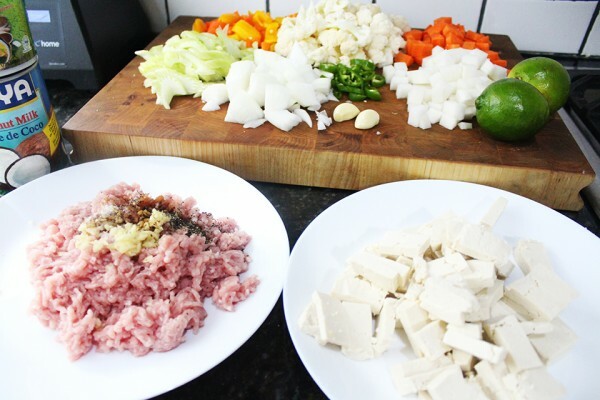 Put the ground pork in a large mixing bowl or on a large plate. Add the soy sauce, fish sauce, black pepper and the grated clove of garlic. 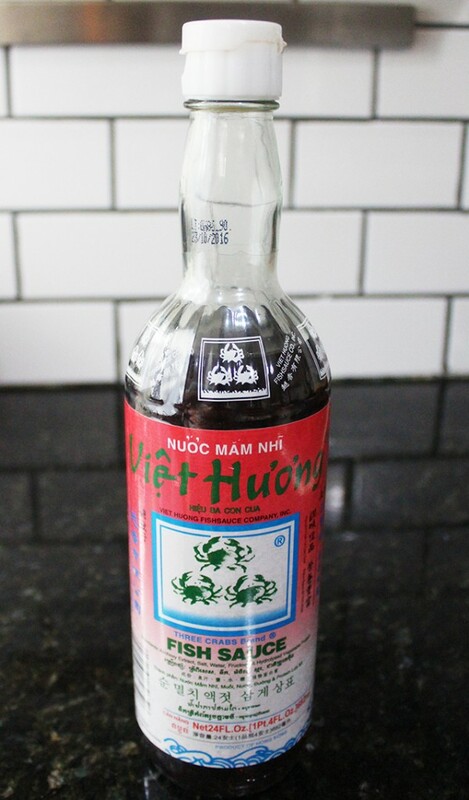 You do not need to add salt, both soy sauce and fish sauce are salty. With your hands mix the pork up. At this point, I like to put the pork aside and wait until my curry is ready for the pork balls. This way I can form the ½ balls and drop them directly into the curry broth. Prep all of the veggies you will be using in the curry. Garlic, onion and jalapenos are always used. With the other vegetables I very seldom use the same vegetables each time I make it. 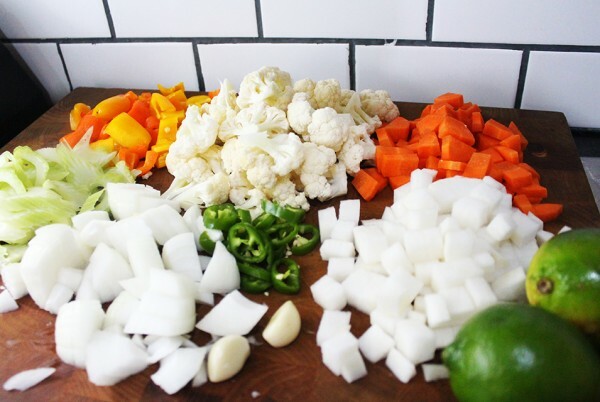 Prep the tofu. Remove from pkg. 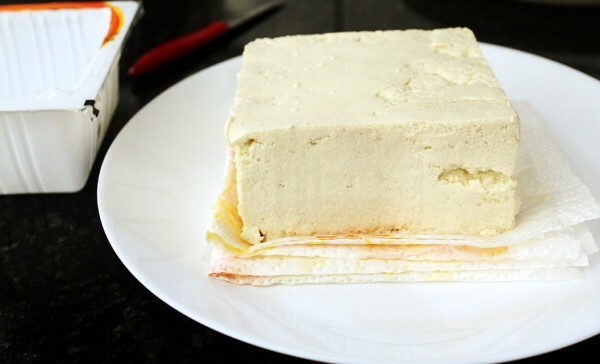 Fold up 5 sheets paper towel, set tofu block on the paper towels on a plate. 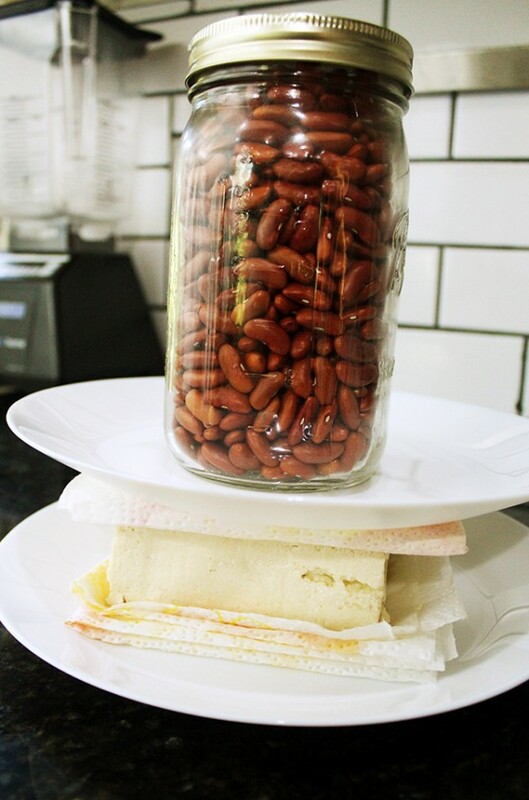 Fold up an additional 5 sheets of paper towel and set on top. Place second plate on top. Set something heavy on the top plate. Leave out for an hour. 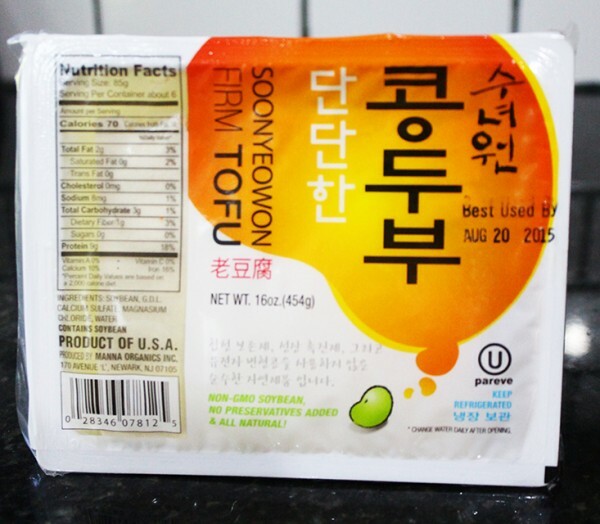 You are pressing the tofu down and extracting some of water from the tofu. 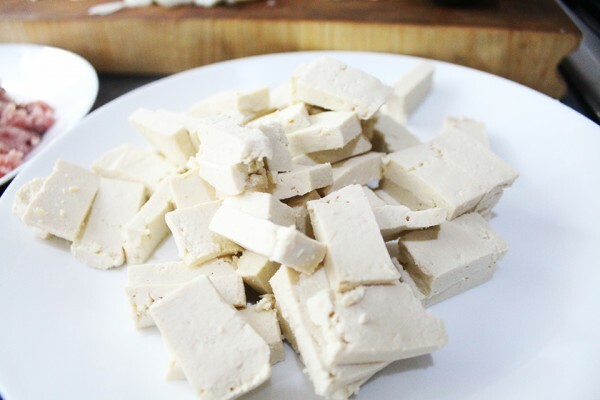 This will help firm up the tofu and make it a little chewier. In a heavy bottomed soup pot add 2 TBSP veg oil. Add 3 TBSP green curry paste to heated oil. Add 1 tsp onion powder and garlic powder. Stir it around in the hot oil for 4- 5 minutes. Add fresh onions and garlic, stir it around for 2 -3 minutes. 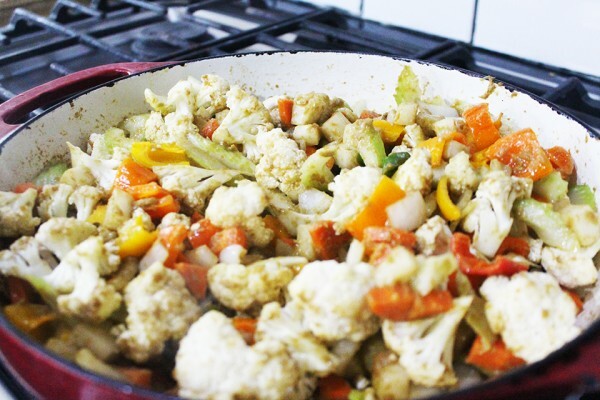 Add all additional vegetables; stir to coat all the veggies in the curry paste. 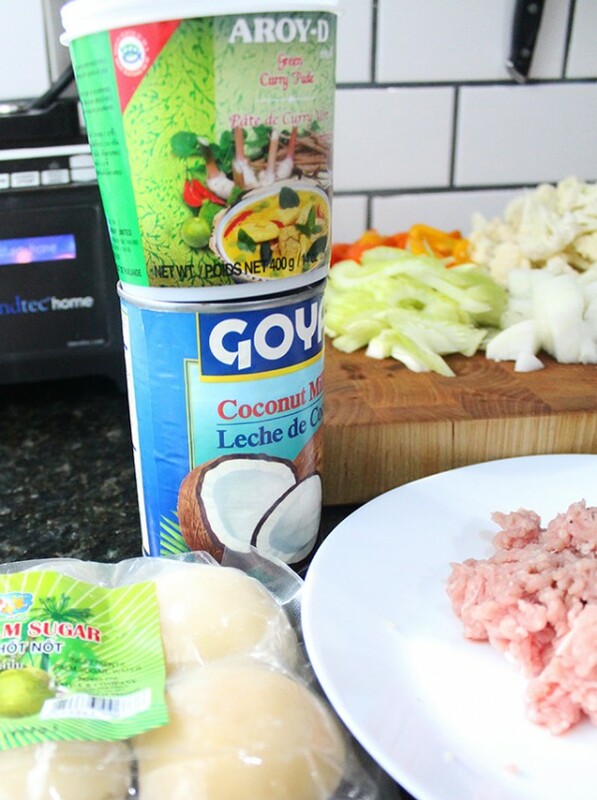 Add chicken broth, fish sauce, soy sauce, can of coconut milk and zest and juice of two limes. 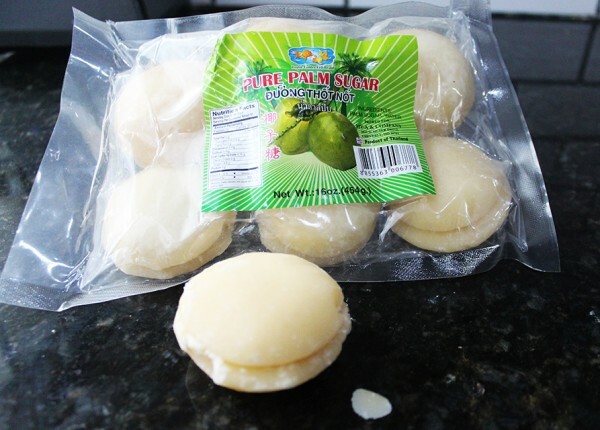 Grate 3 disks of palm sugar (You can pick up this at an Asian grocery market) add it to the curry. Let simmer for 10 minutes. Add the tofu and stir the curry. This is the point that you add the pork balls to the top of the curry, gently stir it (you do not want to break up the pork balls) Cover and let it simmer for 15 minutes. Once the pork balls have cooked and the vegetables are tender, it is ready! If the “broth” is to soupy you can thicken it with a potato starch slurry. Mix 1-2 TBSP of potato starch with ¼ cups cold water, slowly pour into the curry stirring the whole time.